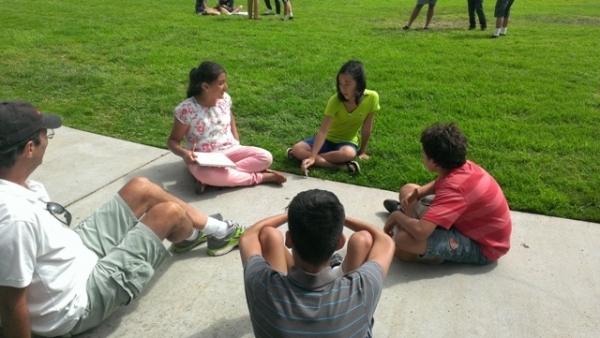 Pacifica Institute’s youth group and a group of youth from the Focolare Movement came together to turn interfaith partnership and friendship into interfaith action for the good of the community. An already ongoing friendship had brought them together once more around a table to share a Ramadan dinner. From there, an invitation from their friends gave the youth of the Pacifica Institute an opportunity to join in for a more fruitful weekend. On Saturday afternoon the groups met in front of the West Side Food Bank. After a quick presentation, the volunteers got to work and started packaging the food, cleaning the area. The youth volunteers enjoyed working together and experiencing hands-on the act of selflessness and working for the good of a fellow human being. It was a creative way to get the youth to reach out to the community while also having a good time with their peers. After a hard task of packing food for those in need, now it was time to relax and have a good time while getting to know each other even more. This new group of friends from the Focolare and Pacifica went to the Ocean View Park in Santa Monica to have lunch and enjoy the rest of their day together. The youth and their families had brought different foods to share, and after lunch they continued with different games and activities that were not only fun but also educational at the same time.